GOO Track is a GPS tracker that lets you locate and communicate with the user, via either your smartphone or our dedicated app. The GPS system uses the tracker's built-in SIM card, which enables it to report its location every 60 seconds. The GOO Track has a telephone mode that means the user can call you if they need to. Use the GOO Track's app to monitor its movements step by step. Available in French and free of charge from Play Store and App Store. Not keen on your child having a mobile phone? GOO Track is the solution. Its SIM card and its app let you know your child's whereabouts at all times. The GOO Track app lets you set entry and exit zones. You will automatically be alerted if the user goes beyond these zones. The GOO Track and its SIM card have a phone number, which means the user can make calls should they need to, as well as receive calls. The GOO Track is also useful for keeping an eye on your loved ones. your loved one in real time, wherever they are. 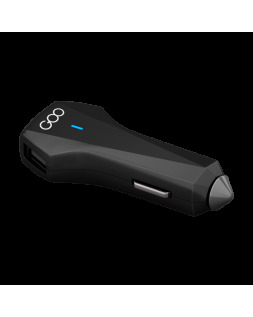 The GOO Track user can call you in the event of a problem by simply pressing the central button. The user can also receive calls from 15 people on an authorised list (30 minutes call time per month). The battery lasts two to five days depending on use. The GOO TRACK comes with a one-year subscription to a mobile network. - up to 100 text messages per month. The GOO TRACK works in France, subject to adequate mobile phone network coverage. The SOS function allows the user to make calls to French telephone numbers, excluding premium rate numbers, (calls to non-French numbers are not authorised).